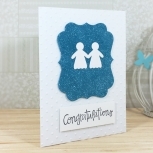 The clean lines of this birthday card balances out the layers of interest in the faux rusted metal background. I made the background piece with ink as well as a red and aqua pearlescent medium. The shimmer in the medium really gives the card that oxidized metal look. 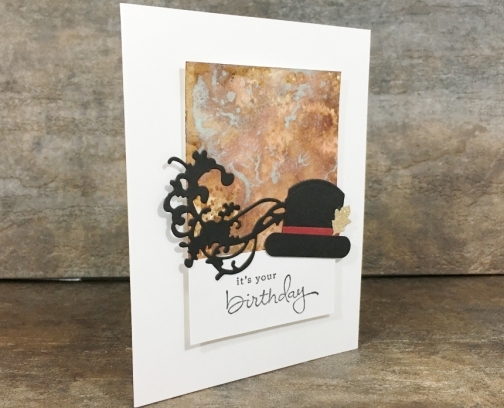 I finished this handmade card with a dapper, handmade top hat with a gold leaf in the brim and stamped a sentiment that reads, "it's your birthday". I popped the centre panel up using a foam spacer. The inside of this birthday card is blank. 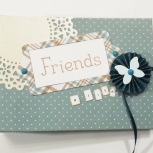 This hand made greeting card measures 4.25 by 5.5 inches (roughly 10.75 by 14 cm) and comes with a plain, white, peel and stick envelope. As with all my cards, it comes in a resealable, cellophane sleeve. I strongly advise that you place your addressed and postage marked envelope inside this sleeve to mail it. Because this card uses a water-colouring technique, it will reactivate and run if it gets wet. 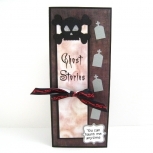 The cello sleeve will help protect your card from wet conditions during transit.